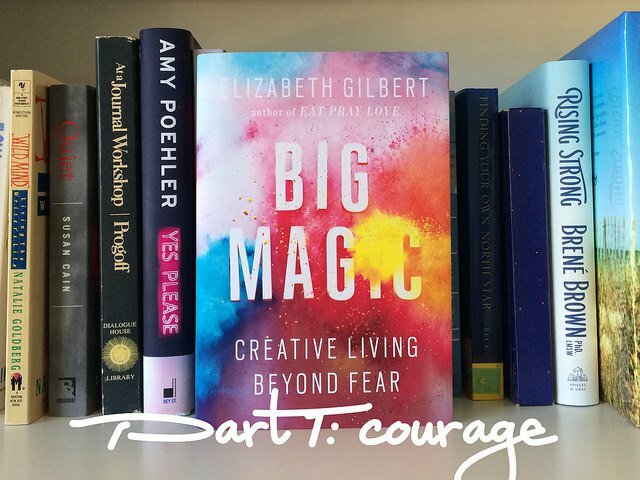 My friend and one of my favorite bloggers Justine is hosting a read-a-long for Elizabeth Gilbert’s new book, Big Magic: Creative Living Beyond Fear. Justine provided prompts for the first section of the book on her blog, and invited readers to respond in the comments or send her an email. At first, I was going to journal about the prompts this morning, then send her an email, along with some times when I could Skype so we could discuss it the next time we talk, but as I started to write out the first prompt in my journal, I thought to myself, “why don’t I just blog a response?” Duh. It’s funny how much work I’ve put into cultivating this space, but then I forget to use it other times when it’s so obviously the right place for something. What are some of the fears that crop up when you think about living a more creative life? My first fear, the most immediate one right now as I consider how I might shift the way I make my living to be more focused on my creative pursuits, is money — how will I make any money if this is how I’m spending my time? Which leads directly to the next fear — time. I worry that I don’t have enough time, that I don’t have the energy or space or days left it will take to accomplish all the things I want to do. After that comes the deep longing to make a difference, to help, to be of service, and wondering if what I do does those things. I also worry about the amount of time my creative pursuits take away from what I can give to Eric and the dogs, the time I can spend with family and friends — am I cheating them, am I giving enough attention there? And finally, (and you’ve heard me say this before, recently), I’m afraid I’m boring, that what I have to offer won’t be meaningful to anyone else. These fears all stem from the same fundamental confusion: I think that living a creative life has to have a product that is worth something, an outcome that is valuable enough to justify itself. It goes back to that same, original confusion: that I have to earn the right to be here, to have the life I want. Like Gilbert’s friend who started ice skating again at 40, what life affirming pursuits are you denying yourself? How can you begin “to appreciate the value of (your) own joy”? I’m most definitely denying myself joy. I think I have to accomplish a certain amount first, that joy is the reward for hard work rather than a necessary condition of living. Things I don’t do as much as I’d like: read, nap, relax, laugh, pause, make art for art’s sake, practice yoga, stretch, sit in the sun, go outside, hike, take long walks, ride a bike, garden, follow my curiosity, spend time with friends, play with my dogs, do nothing, have no plans, focus on one thing at a time. I’d like to learn how to swim and play the ukulele, take singing lessons or a painting class. But even these things I can turn into a project if I’m not careful. How I can begin is to stop, as weird as that might sound. To stop doing, stop trying, stop planning. Just stop and see what happens, wait for what might arise. Gilbert tells the story of arguing for her own limitations. 1. Why do you think it feels easier to argue for our limitations rather than for our strengths? We are so desperate to let ourselves off the hook, somehow think that it’s easier to give up. We make a lot of effort to avoid what is hard thinking we can get ourselves out of it somehow. Fundamentally we are struggling with the truth of how hard life is, how vulnerable we are, what a raw deal it is that we love and delight and enjoy our life just to one day lose everything. If we can hide away in our cocoon of excuses, we think we can skip that part, pretend it away. It makes me think of the Pema Chödrön quote, “To be fully alive, fully human, and completely awake is to be continually thrown out of the nest.” We think we can excuse ourselves from that experience if we have a good enough reason. 2. What limitations of your own do you argue for? I can’t because I have too many responsibilities, things I have to do first. I can’t because I’m too tired, not strong enough. I don’t have enough time. Why should I have to when she/he isn’t doing anything? Why can’t my life be easy? It’s harder for me. I work so hard, shouldn’t I get a break? I didn’t start early enough. I’m too sad, too stressed out, too many bad things have happened. 3. What thinking, saying or action can you embrace to argue for your strengths instead? Being present always feels better than being numbed out. No matter how scary or difficult the situation, my innate wisdom and compassion will guide me — I always know what to do, even if it’s to admit that I don’t know what to do. Doing the hard thing is so much easier than what it would take to avoid it. Showing up with an open heart is my superpower. As you go about your week, think about approaching your day with curiosity instead of fear. What does that shift for you? Does it create any ease? There’s a lot of talk recently in the books I’m reading, most specifically this one and Brene’ Brown’s Rising Strong, about shifting to being curious. This non-judgmental approach, this leaning into what’s happening with an open mind and heart, allowing whatever might arise and being curious about our reaction rather than immediately reacting is something I already practice, in all the ways I practice — yoga, mediation, writing, and dog. I’m so lucky to have been taught this in all my traditions, to know this is an option and to have seen the outcome in my own experience. This approach shifts absolutely everything, creating ease and space and sanity. Thank you Justine for the prompts, for the chance to get to think about these things, contemplate and reflect. I especially appreciate the way listing my fears made it clear that they really are all the same fear underneath. This entry was posted in Allowing Myself, Big Magic Read-a-Long, Elizabeth Gilbert, Justine Taormino and tagged Allowing Myself, Big Magic Read-a-Long, Elizabeth Gilbert, Justine Taormino on October 17, 2015 by jillsalahub. “Showing up with an open heart is my superpower.” I love this. That is a wonderful superpower to have. My daughter (who is 3) decided that she had a superpower – when I asked her what it was she said purple. I asked her what purple meant and she said it means you can do this (and ran around like a crazy person). She meant she is super fast at running. My son was sad all of a sudden as he said he doesn’t have a super power. My daughter said his is blue. He was saying he doesn’t know what that means (he is 5 and so sensitive) and I said it is being kind. He is the first to jump in when someone is sad and tries to cheer them up. That happened earlier today and then I have come online to read a little and just had to say that showing up with an open heart is an awesome superpower. my son recovered his 5 year old self and then was also running around like a crazy person who is kind. I would like to imagine a world where we all felt free to live with open hearts – that it didn’t have be a superpower to show an often cruel world our true selves. Thank you for using your superpower.